Does Adobe have a gun to your head? I've been looking at buying a car recently, and have been slightly alarmed at how much what I would like to buy costs. My ten-year-old Peugeot is worth almost nothing now as a trade-in, so the reality is that I'm starting from scratch, just as I did when I was 20. I'd quite like a new car for once, but as the value of new vehicles plummets the moment they leave the forecourt I've been investigating lease agreements. That too seems alarming at first, but it may be better than being robbed by a finance company – and when the time is up I can just give the car back and get another new one. It seems a neat way to avoid ever owning an old car that costs a fortune to service and which has no value other than its fading function. For £2500 a year, in today's money, I can drive a nice up-to-date, comfortable and reliable family car every day until it is my children's turn to drive me to parties all over the country. Is this the business model that Adobe is presenting us with in its subscription-based services? We always get to drive the latest photo software, but instead of shelling out a fortune to buy it as a one-off purchase, we lease it? Doesn't that sound good? Well, yes, in theory, but of course in practice we don't always need the latest version of any software package, as we only need the version that works with the camera that we own. 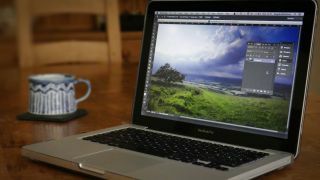 Photoshop gets updated to a new version every 18-24 months, but most enthusiasts update their camera only once every four years, and professionals once in every two. New Photoshop versions come with new features that will attract some, but perhaps the principal reason for a photographer to update is to get the latest version of Camera Raw – which becomes outdated as soon as you buy a camera that is not supported by the version you are using. If this change in the way Photoshop is sold has upset so many people, why has Adobe done it? I think we all know the answer to that – because we all know someone who owns a copy of Photoshop that they didn't pay for. Adobe has been ripped off and had its products pirated for years. A subscription model allows the company to protect its property from those who want to steal it. It is also easy to forget that Adobe owns Photoshop and, like a barman, can decide how and whether it will sell to us - 'No sorry sir, we don't serve beer in pint glasses here' - just as we can decide where we go to play darts. Some might argue that if Photoshop hadn't been so bleeding expensive in the first place all that theft wouldn't have occurred, and Adobe would perhaps respond that it had to charge what it did so it could pay the people that have made it the world's premier imaging and design software producer. No one has to use Photoshop, but the fact is many people want to because they consider it to be the option that best suits the way they like to work. Not just by a little bit, but by far. If there were plenty of excellent alternatives, photographers would just switch, but the fact is a large proportion of the market feels there are no alternatives. The fear of being backed in to a corner by these changes has made many photographers angry - but we do all still have choices. Our cameras come with free software that includes a raw conversion application. Why don't we use that? There are independent brands, such as DXO, Capture One, ACDsee and Corel, which produce applications we could all make use of instead. We only have to decide if they are as good and whether they have the functionality we require. Frankly, 1998's Photoshop 5, with the introduction of the History Palette, included 95% of the features I need to use on a daily basis, but it is annoying that my CS6 will never get an update beyond Camera Raw 8.3 that will allow me to work with the emerging generation of cameras. Is £8.78/US$9.99/AU$9.99 a month too high a price to pay to have a choice over whether I use my free steam-driven SilkyPix bundle or Camera Raw? If I choose Camera Raw the photographer's package of PS and Lightroom will cost me (if the £8.78 per month price stays in line with inflation) £421.44 (US$479.52/AU$479.52) for my usage over the next four years. In those four years Photoshop will probably shift from version 14 to 17, and a standalone package bought now will be three generations old. When we consider that a new version of PS CS6, from a non-hooky reseller, now costs more than £500, the deal starts to look not quite so bad at all.